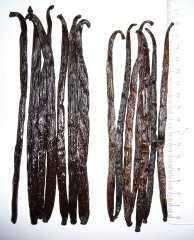 Click here for the full Madagascar Planifolia vanilla bean comparison gallery. 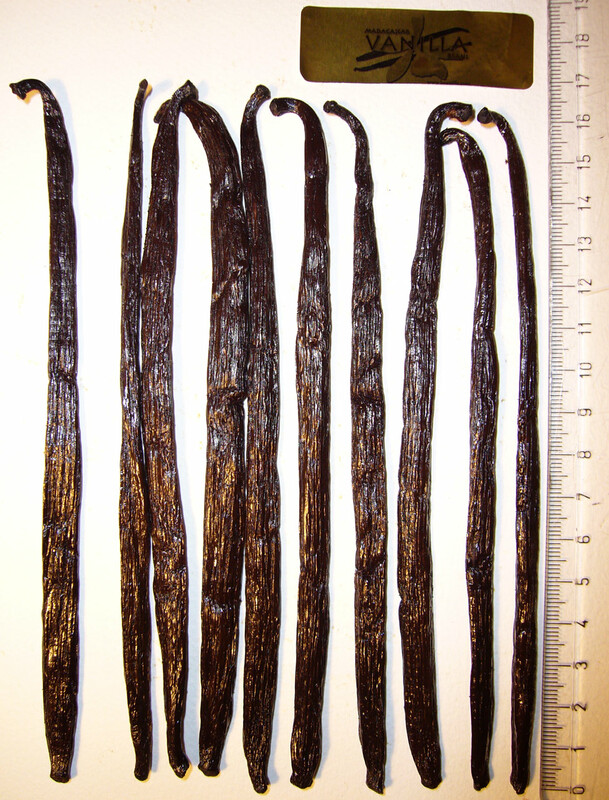 Nearly every vendor has a Madagascar origin vanilla bean. 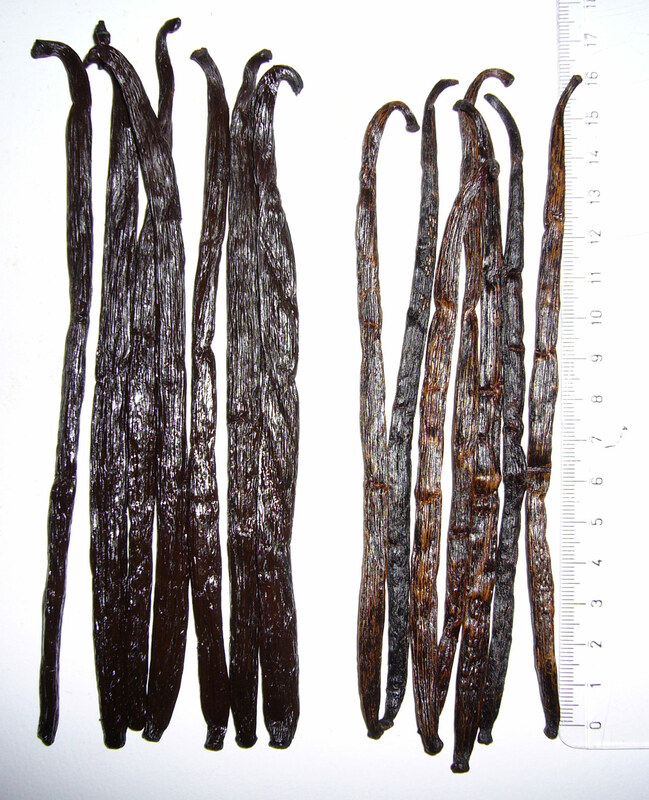 A comparison demonstrates the extent to which vanilla grown in the same country can carry. Why are they so different? I imagine ripening, curing, and handling all play a role. Your thoughts? Grade A gourmet beans should be moist and oily, with the approximate color and shine of a raisin. The pictures are a bit shiny, but you can notice the darker color of the Grade ‘A’ bean and the softer flesh (as can be seen in the bisection pictures). The Amadeus Super-Long Madagascar and Beanilla.com Madagascar are also very ‘plump’ or ‘fat’ beans, while the Vanilla Products USA beans were a bit thin and flat. It’s fairly easy to spot lower-quality (extract) beans. Grade B extract beans should be drier and less attractive. The major indicators are an overly-dry skin that doesn’t flex well. If you bend a so-called “gourmet” bean and it breaks, this is a bad sign. The broken bean pictured below is a good example of this. It has plenty of caviar and flavor, but doesn’t meet my standards of Grade A beans. Fine for making extract, though. 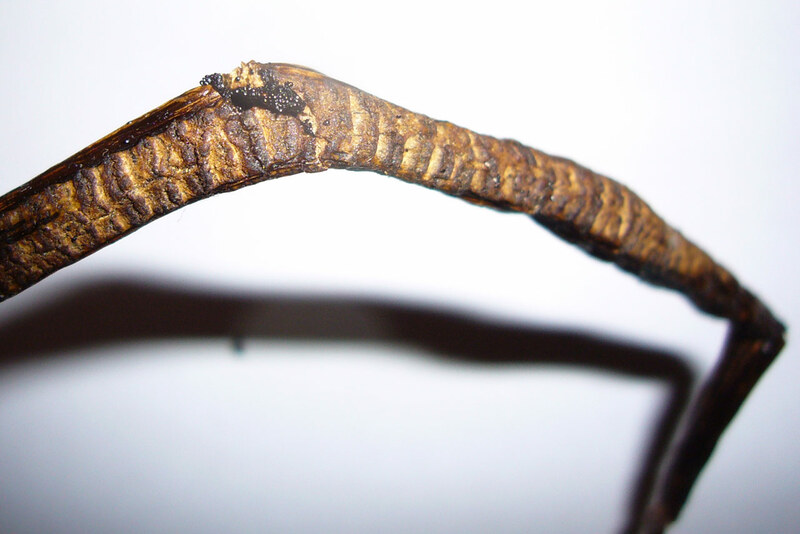 The broken bean is a Grade A Regular-Sized Madagascar bean from Amadeus Trading. I am convinced this is an isolated incident. Glenn at Amadeus provided fantastic service and replaced these beans with some very nice “Super-Long Madagascar” beans. This is further confirmed by instructables member cdrivanova’s Flickr photo set that shows some nice regular-sized Madagascar beans from Amadeus. Except for a couple regular-sized Madagascars, the beans from Amadeus were all very nice. I’m convinced that a few dried old beans went out from the bottom of the box during the busy Christmas season. Michel, your post(by the time I read it) is several years old but I would be interested in distributing your beans. Please provide updated prices and what volume you would require for a partner. Also let me know grades and price variation within the grades. Just e-mail me! 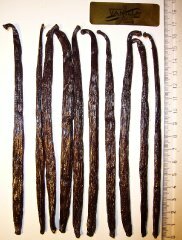 So how were did the vanilla beans from Vanilla Products USA compare in flavour? I was thinking of getting some from their ebay site. The Amadeus one’s are ridiculously expensive to ship to Canada (unless their checkout/site just isn’t configured properly to give a fair shipping estimate). Ohh, i see you have vendor reviews too. That’s good. Beanilla offers affordable shipping to Canada as well. Mr Giusti do you have an email so that I can reach you?